For months, Native-American activists and sympathetic people from across the country have been engaging in courageous civil disobedience and protest at the Standing Rock reservation in North Dakota, opposing the construction of the Dakota Access Pipeline (DAPL) on the grounds of its environmental dangers, and the desecration of lands sacred to the Native population. And amid reports that President-elect Donald Trump is actually a stakeholder in the company behind the pipeline, if you want to support the cause, you'd better act now: here's how to call your representative to protest the DAPL. Make no mistake, however bleak things might seem, and however powerless you might feel watching the water protectors' struggle from afar, contacting and lobbying members of congress is a very worthwhile use of your time right now. Especially considering that you now have a new line of argument to put to your elected representatives ― that in addition to all the existing reasons to oppose DAPL, Trump's refusal to place his assets into a blind trust (a real one, not letting his kids run things) has created a clear conflict of interest. Fortunately, it's not that hard to track down the contact info for your congressperson, or for Republican members of congress (who it's very important to let know they'll be held to account on this). In fact, you can find it all at the respective House of Representatives and U.S. Senate directory websites, where full contact lists are posted. Be polite, rather than fire-breathing or agitated. Remember, the person you'll be talking to won't be the politician themselves, but rather a staffer, and there's no good reason to treat them poorly. To the contrary, if you're being rude and aggressive towards the person you need to pass along your message, that'll probably work against you. Plan out what you're going to say ahead of time. Citing the apparent conflict of interest with Trump is a great point of entry, especially if you're calling a Democrat ― you can help make the case for congressional Democrats to urge President Obama to halt the DAPL altogether on his way out the door, given that his successor appears to be crucially ethically compromised on the issue. This is worthwhile to bring up to Republicans too, as you can insist that Trump's myriad conflicts of interest should (in fact, must) get just as much withering scrutiny as the GOP focused on Hillary Clinton. 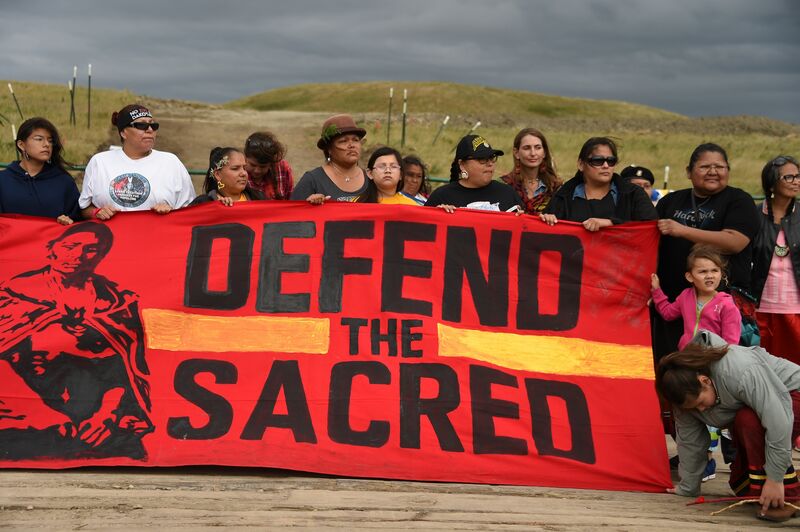 Whoever you're talking to, make it plain that you stand with the water protectors of Standing Rock, both on grounds of the pipeline's potential environmental impacts, and the rights of Native-Americans to have agency over the protection of their lands. Don't just call your representative or senator's national office ― track down the numbers for their district offices and place calls there first. District office info will almost certainly be available on their websites, if you look around for contact information. Basically, if you have the time, you should get on this right away. With the Standing Rock protesters facing increasingly draconian and dangerous treatment by the authorities (like high-force water cannons in already freezing temperatures), and the halls of power showing alarmingly little concern, it's important to reach out now rather than later.